There is no such thing as a GMO cranberry. 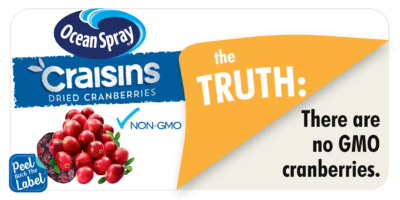 Ocean Spray’s “Craisins® Original Dried Cranberries” only have two ingredients – cranberries and cane sugar, and neither the berry plants nor the sugar cane has genetically-modified versions But, that hasn’t stopped Ocean Spray from including a non-GMO label on their product. Ocean Spray’s decision to use a non-GMO label is surprising, given their clear understandingthat GMOs are both beneficial and safe. Their website boasts about how they want to inform the public of GM technology’s safety and “support the continued safe and effective use of agricultural biotechnology to increase the food supply while lowering cost.” Yet, at the same time they are joining the latest labeling craze by slapping an unnecessary non-GMO label on their product. Why does Ocean Spray use a non-GMO label? It’s certainly not about transparency or truth. It’s probably about selling more of their product by capitalizing on consumers’ misconceptions regarding GMOs. If “food safety and transparency” were really a “top priority” for Ocean Spray, they would stop misleading their consumers. Unfortunately, it looks like they want to have their cranberry cake and eat it too! If you want to tell Ocean Spray to stop the fearmongering, send them a Tweet at @OceanSprayInc or call them out on Facebook.